Have you ever thought about the fact that your life counts and that you can do good and make a difference? Maybe you've had things said to you like you're not good enough or not clever enough. Maybe some people have said things like you'll never achieve anything or that you're useless. These are complete lies. I want to start this assembly by saying that if someone has ever said that to you, I'm sorry they said it and they are wrong. Don't listen to the bad things people say about you. You were created unique and as a Christian I believe there is a God who loves you completely and has a good purpose for your life. But even if you don't believe in God or don't know what you believe, your life can make a difference. This funny video is 6:07mins long and is about clearing up litter, with Pink Panther trying all kinds of ideas! If you need a shorter edit, show 0:35mins - 1:17mins and then 04:30mins - end. If you drive a long any roads around the country or maybe take a walk along a beach, you will see that there is loads of litter everywhere. People are just too lazy or don't care about litter so they throw it on the ground. In some cases, litter can poison animals or even kill cows and sheep who choke on litter or who can't digest them and so they die quite a horrible death. Maybe one difference you could do is not to throw your litter on the floor. I've even heard students say things like, "I don't care if I throw litter on the floor. Someone is paid to pick it up." But that's totally wrong - very often people have to spend time picking up litter and can't do the things they need to do. Other times it can distract people or ruin their day out. 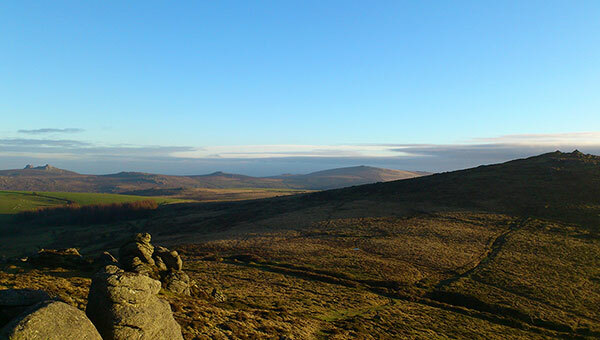 This picture is taken on Dartmoor. It looks like an amazing wilderness. The Tor at the back left of the picture is called Hound Tor and it's a popular day out for scramblers, families and climbers. One day myself and a friend were practicing a thing called bouldering which is basically climbing on a small scale. I found a tray of rubbish and a glass bottle where I was bouldering which annoyed me, so we looked for more. Over the next hour we picked up nearly a bin bag full of rubbish which I took home and put in the bin. In the end we didn't do much bouldering! What looked like an unspoilt wilderness was actually full of litter. But this litter often is reflected in our lives. Sometimes we walk around and we look good but underneath and inside of us there's lots of 'litter'. What I mean is lots of issues and problems and worries and fears. Or we come across other people who have problems. Being someone who picks up the litter is a good thing. But being someone who helps other people with the 'litter' inside their lives is an amazing thing. We can do good by choosing to help people and to pick up litter! There is a true story of a woman who heard a speaker talk at her church and mention something about litter. The lady had always picked up the litter in front of her house but there were loads of beer cans in the alley to the side of her house where people threw down their beer cans. After she heard the talk, she felt challenged by God to go and pick up the beer cans in the alley, so she did. In the 6 months since that day, no other beer cans have appeared in the alley. So here's a thought for you. If we throw down litter, more litter comes along. But if we clear up the litter, then less litter comes along. I have heard of streets in the USA in rough violent neighbourhoods where the people have picked up litter, planted little gardens and small things like that. What happened? The area began to see a reduction in crime. I've also worked in the 'hood in Delaware in the USA and seen the damage caused by neighbourhoods where violence and vandalism has ripped apart strong communities. Around the world, you will find Christians showing God's love by clearing up neighbourhoods, picking up litter, painting people's houses, mowing their lawns, doing shopping for neighbours. Why? Partly because Christians should be full of God's love (we're sorry when we're not!) and partly because it brings change for the better. Every action of good, every positive thing we do makes a difference and brings hope. As a Christian, I believe that the greatest hope is Jesus. He is the one who can take all the junk, all the litter, all the problems and issues in our lives and start to turn things around for good. All we have to do is ask him. Whatever you believe, make a difference, do good and see positive change.